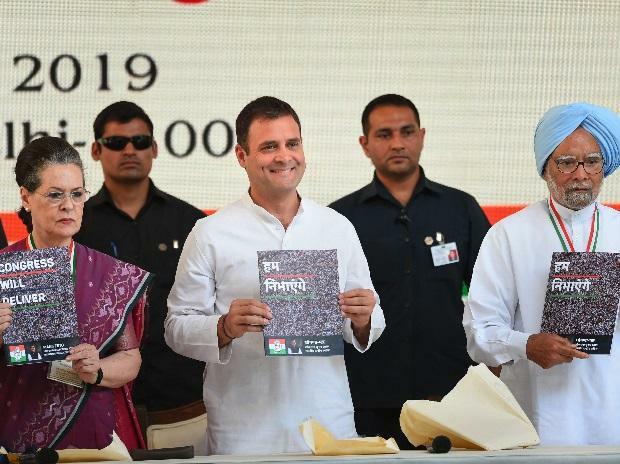 The Congress, in its manifesto released on Tuesday, has promised a new minimum income scheme to the poor, higher allocation to education and health, and more job-days under the Mahatma Gandhi National Rural Employment Guarantee Scheme (MGNREGS), while committing itself to reduce the Centre's fiscal deficit to 3 per cent of GDP from 2020-21 onwards against the projected 3.4 per cent in the current financial year. In its manifesto, titled “Congress will deliver”, the party vowed to fill 400,000 vacancies in government, public sector enterprises, parliament, and the judiciary before the end of this financial year, abolish the controversial angel tax, reverse “unwarranted and illegal interference of the BJP government in the functioning of RBI”, address “tax terrorism”, enact the Direct Taxes Code in the first year of the government itself, and have a single moderate standard goods and services tax (GST). The 55-page document said two or three public sector banks would be amalgamated to end up having six-eight lenders. It promised a “Make for the World” policy, under which foreign and Indian companies would be invited to invest in exclusive export-only zones. There will be no indirect taxes and lower corporation tax in these zones. The party said it would bring back the Planning Commission to replace the NITI Aayog, and give it “redefined responsibilities like formulating medium- and long-term perspective plans”. The manifesto, released by Congress President Rahul Gandhi, former Prime Minister Manmohan Singh, UPA Chairperson Sonia Gandhi, and senior leader P Chidambaram, among others, assured everyone the party would present a separate "kisan" budget to ensure priority to issues affecting the agriculture sector. The party promised to put farmers on the path to “Karz Mukti” (freedom from loans) from “Karz Maafi” (loan waiver). This will be done through remunerative prices, lower input costs, and assured access to institutional credit, the party said. Amid declining private investment, the manifesto said the party would raise gross investment to 35 per cent of GDP and gross savings to 40 per cent of GDP. The investment rate stood at 32.3 per cent and gross savings rate at 30.5 per cent in 2017-18, according to the latest official figures. The Congress said it would implement a guaranteed cash transfer of Rs 72,000 a year to 50 million poor families under the Nyuntam Aay Yojana (NYAY), to be executed in phases so that the estimated cost would be less than 1 per cent of GDP in the first year and less than 2 per cent in the second year. It also promised to double allocation to education to 6 per cent of GDP and raise it in health to 3 per cent, besides upping the number of days to 150 from 100 under the MGNREGA. ALSO READ: Congress manifesto highlights: Priority to jobs, farmers and Rahul's NYAY When asked how the Congress was committing itself to a fiscal deficit of 3 per cent of GDP from 2020-21, Chidambaram said nominal GDP was rising over the years and bigger GDP would make the cost of these programmes look smaller as the percentage of the size of the economy. He said GDP at current prices was estimated to be Rs 210 trillion in 2019-20 compared to Rs 124 trillion five years ago. To a query over the impact of the NYAY on allocation to food security and the MGNREGA, Chidambaram said there could be overlap between the two programmes but that was not bad for the poor. Rahul Gandhi said the Congress would strengthen government hospitals and give high-quality health care to the poor. Amid the debate on rising unemployment, the manifesto said the party would ensure 3.4 million jobs in the public sector. It would request state governments to fill all vacancies, estimated at 2 million, in health care and education, and local bodies as a precondition for devolving funds to them. ALSO READ: Congress' NYAY: Unanswered questions The party will create a ministry of industry, services and employment. "Today, unemployment is touching a 45-year high of 6.1 per cent, according to the government's own figures," the manifesto said. Pointing out that monetary policy was the province of the Reserve Bank of India (RBI), the Congress said it would respect the autonomy of the central bank in matters reserved to it under the RBI Act, 1949. However, the governor of the bank will periodically render an account to a committee of Parliament. “The Congress promises that the government will work closely with the RBI to ensure that fiscal policy and monetary policy are aligned to achieve the common goal of growth with price stability,” the manifesto said. When asked how the GST rate could be the same for all goods, Chidambaram said it was a single standard rate the world over. “BJP should have followed report of its own (former) chief economic advisor (Arvind Subramanian). Why call it GST and give a bad name to it?” The party promised panchayats and municipalities a share of GST revenues.